When the asylum opened in 1849 it provided hot and cold running water that was heated with a boiler and pumped via a steam engine from the lake to the 12, 000 gallon tank in the building’s central dome feature. 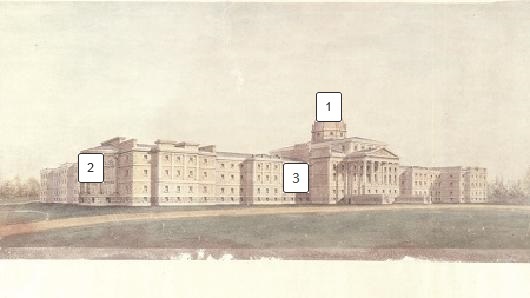 Howard placed large common rooms and a semi-circular verandah at the end of each wing for patients to gather and relax, a feature he borrowed from the Worcester State Hospital5. The east, south and west wings of his original plan were never built. 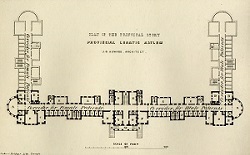 In 1856, the province hired architect Kivas Tully to build additional wings for the asylum. Howard put careful thought into how patients would experience asylum. He provided long, wide corridors to allow for ease of circulation and social interactions. He designed the corridor so that it formed part of the exterior walls at places where he included windows to provide fresh air, natural light and views of the grounds and Lake Ontario.